With superstar Rajinikanth's latest release, Kabali, almost in cinemas, some employers in the city have fallen to the star's charm and not only declared a holiday on the day the movie releases, but also booked tickets for employees. With the movie scheduled to release on Friday, July 22, fans have already started flooding their employers with leave applications to catch the first-day first-show. Opus, a structural solutions start-up in the city, has gone as far as declaring a holiday on July 22. As the firm's official notice goes, the holiday is declared to "avoid sick leaves, mobile switch-offs and mass bunks". Manoj Pushparaj, head of operations for the firm, says this was done to motivate employees. The start-up is also arranging tickets for all 48 staff in a partnership with PVR cinemas. "The employees come from different parts of India, and 18 of them are from Tamil Nadu," he says. Opus is not the only start-up to declare a holiday for the film. 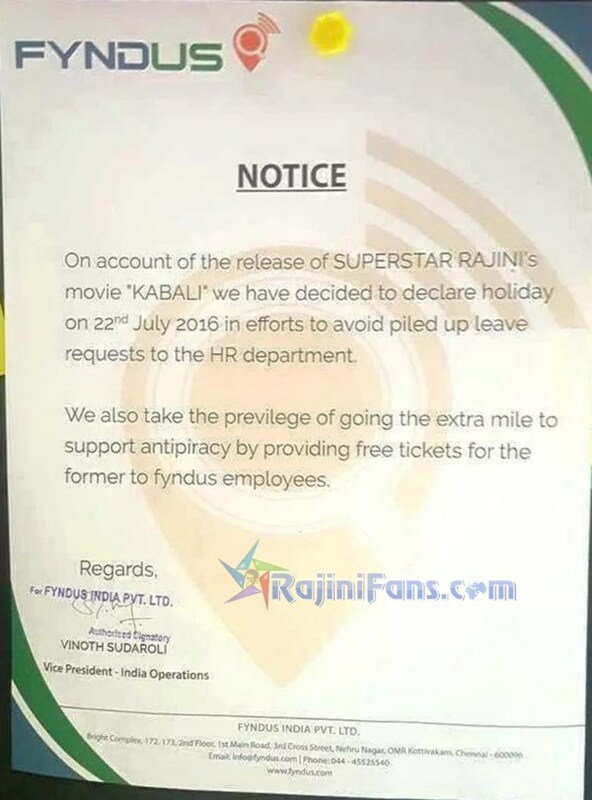 Fyndus, a data management start-up from Chennai, has also declared a holiday in an attempt to deal with Kabali frenzy. When contacted, the company confirmed that a holiday was declared by vice-president, India Operations, Vinoth Sudaroli. "We didn't want to get a pile of leave applications from our employees and hence we have declared a holiday on Friday," they said. In addition to this the company is also providing free tickets for the entire team so that they can enjoy the movie on the big screen. Those employees who are not fortunate enough to get an official day off are drafting their leave letters already. Rajith Raj, who works in a nationalised bank in the city says he has already applied for his leave. Few techies from the city have plans to "fall sick" on Kabali Day and of course they did not want to be named, lest their plans be foiled. Watching the first-day first-show is not something that can be compromised on, think a majority of fans. So high is Kabali fever that few enthusiastic fans from Chennai have also gone as far as launching an online petition requesting the Tamil Nadu chief minister to declare an official holiday on the date of movie's release. "We humbly request our CM Jayalalithaa to declare Friday as a public holiday, which will enable people to watch the movie in comfort, without the hassle of taking leave," goes the petition.